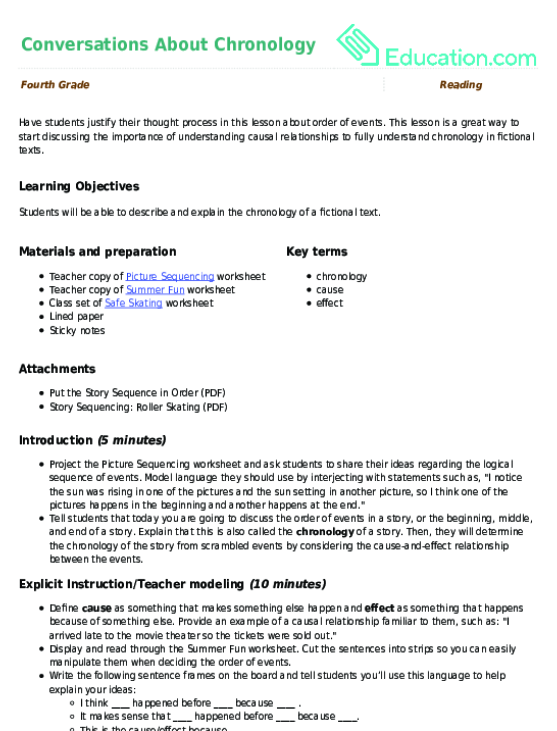 Students will be able to describe and explain the chronology of a fictional text. Project the Picture Sequencing worksheet and ask students to share their ideas regarding the logical sequence of events. Model language they should use by interjecting with statements such as, "I notice the sun was rising in one of the pictures and the sun setting in another picture, so I think one of the pictures happens in the beginning and another happens at the end." Tell students that today you are going to discuss the order of events in a story, or the beginning, middle, and end of a story. Explain that this is also called the chronology of a story. Then, they will determine the chronology of the story from scrambled events by considering the cause-and-effect relationship between the events. Define cause as something that makes something else happen and effect as something that happens because of something else. Provide an example of a causal relationship familiar to them, such as: "I arrived late to the movie theater so the tickets were sold out." 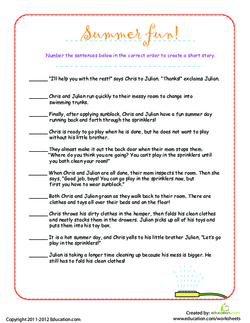 Display and read through the Summer Fun worksheet. Cut the sentences into strips so you can easily manipulate them when deciding the order of events. I think ____ happened before ____ because ____ . It makes sense that ____ happened before ____ because ____. This is the cause/effect because ____. I agree/disagree with ____ because ____ . Think aloud, sequencing the words and changing your mind about the order based on the cause-and-effect relationships of the events. Ask a student to use the last sentence stem and agree or disagree with your chronological order of the events. Tell students that now it’s their turn to order events. Explain that they’ll need to read the text, cut out the strips, put them in the correct chronological order, and paste them onto a blank sheet of paper. Remind them that they’ll be working in groups and the group has to agree on placement, so they’ll have to explain their reasoning. 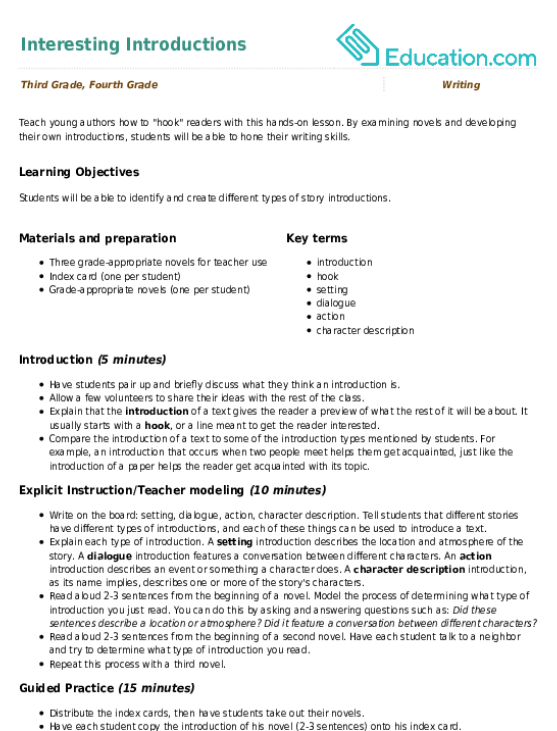 Distribute the Safe Skating worksheet and a blank sheet of paper to each student. Ask one student to repeat the instructions and allow students to work in groups to order the events. Allow groups to share their order of events. Randomly choose two consecutive events and ask the group to justify the placement of the events. Choose different students in the group so they all have a chance to add to the rationale. Distribute the lined sheet of paper to each student. Answer this question: Why do you think the chronology you compiled in groups is correct? Choose two events and label one as the cause and the other as the effect. Explain why the cause has to happen before the effect. Allow students to use sentence frames in their discussions with their partners and groups. Ask students to visualize or draw pictures to help them understand the sequence of the events. Allow students to complete the Picture Sequencing worksheet using correct transition words in their writing. Distribute sticky notes and ask students to write why it’s important to understand the chronology of a text. Remind them they can use the sentence frames from the board to assist in their explanations. Allow one or two students to share their sticky note answers with the class. Ask one student to reword the presenter’s written response. Have students justify their thought process in this lesson about order of events.